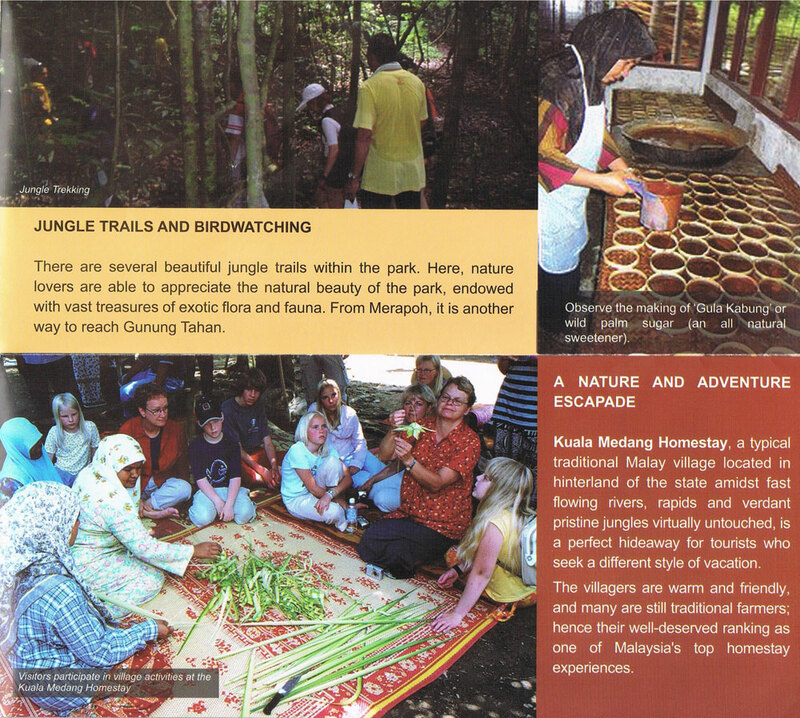 Tourism Pahang is responsible for managing national, state, regional and metropolitan parks, conservation reserves, many signhticant cultural assets and major waterways. All Information contained herein is correct at the time of production. 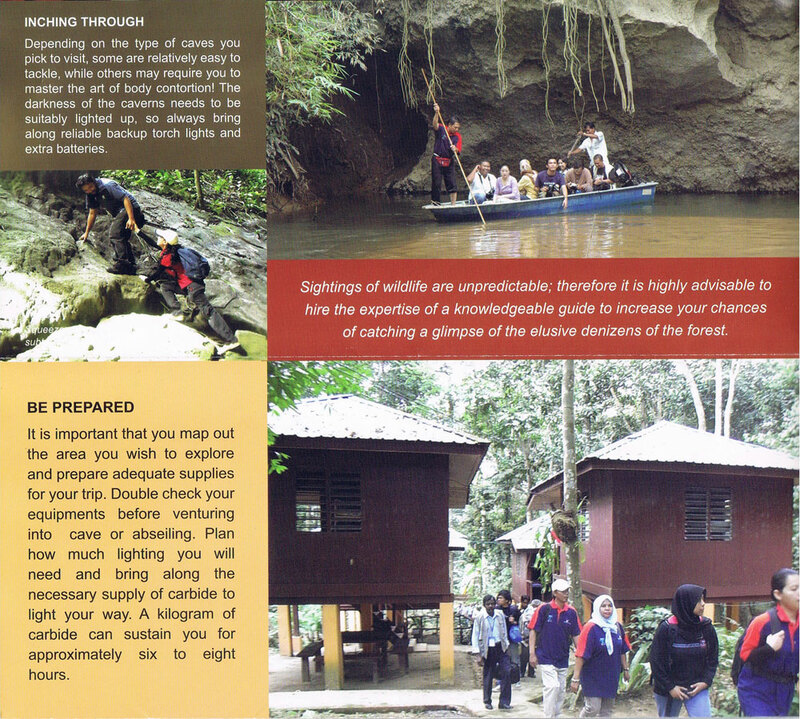 Whilst every care has been taken in the praparation of this brochure, Pahang Tourism cannot be held responsible for any inaccuracy, omission, or alteration that may occur. 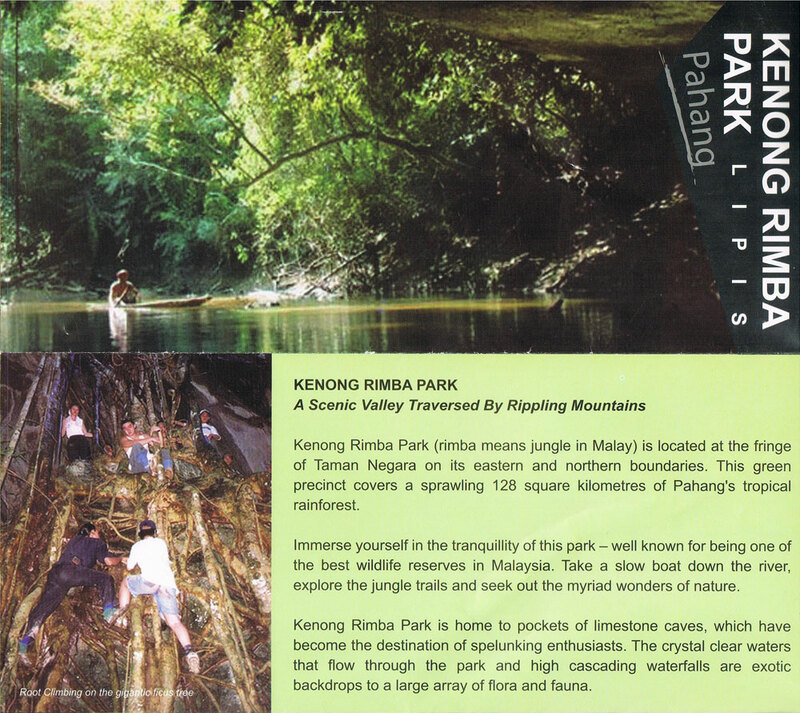 At Kenong Rimba Park, you can get comfortable accommodation and decent chalets at reasonable prices at the Jungle Lodge or choose to camp at designated sites. 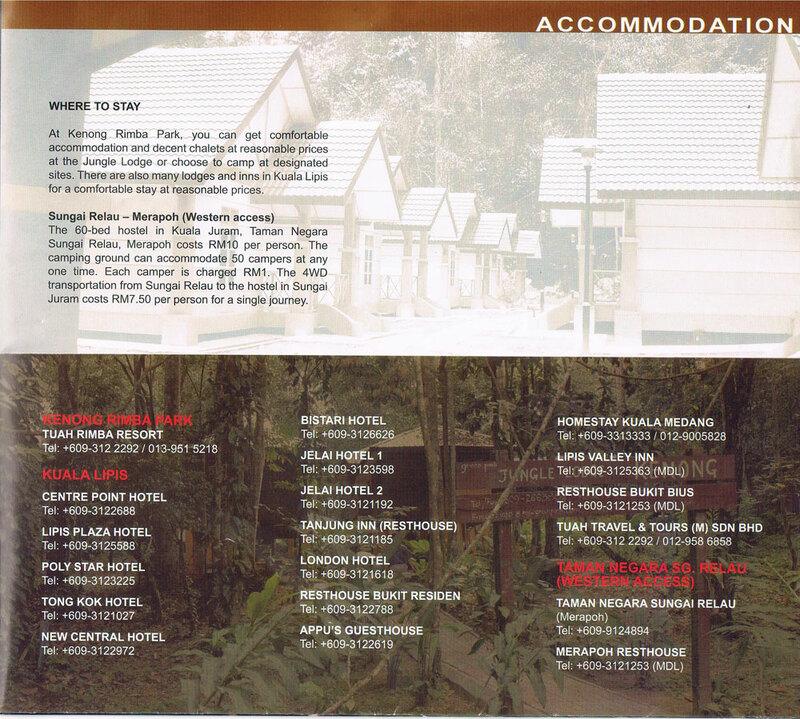 There are also many lodges and inns in Kuala Lipis for a comfortable stay at reasonable prices. The 60-bed hostel in Kuala Juram, Taman Negara Sungai Relau, Merapoh costs RM10 per person. The Camping ground can accommodate 50 campers at any one time. Each camper is charged RM1. The 4WD transportation from Sungal Relau to the hostel in Sungai Juram costs RM7.50 per person for a single journey. Lipis is 180 km from Kuala Lumpur and 250 km from Kuantan. If you drive, take the Lumpur-Karak Highway and turn left to Bentong and proceed through Raub. And if you are frorn Singapore board a train direct Kuala Lipis. 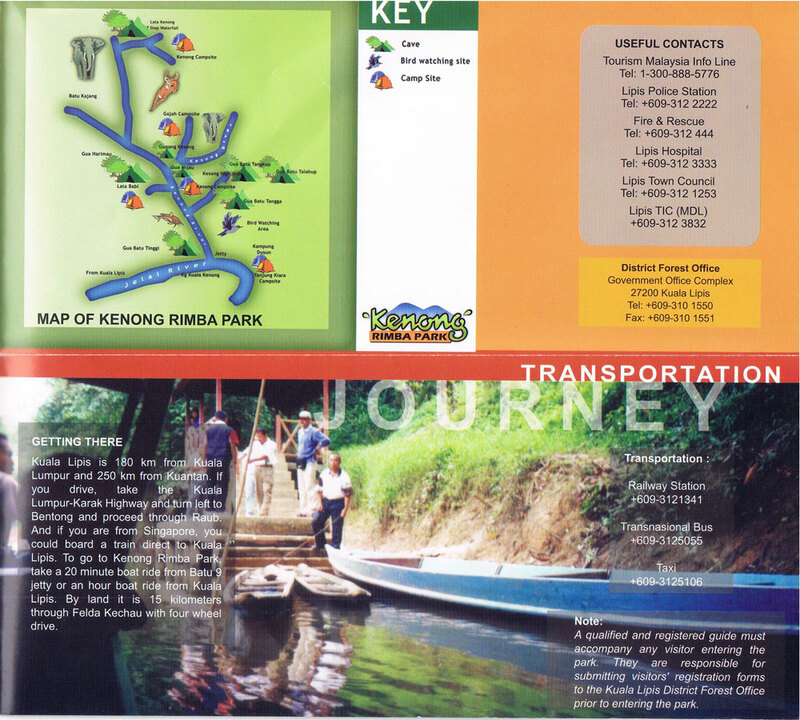 To go to Kenong Rima Park, take a 20 minute boat ride from Batu 9 jetty or an hour boat ride from Kuala Lipis. 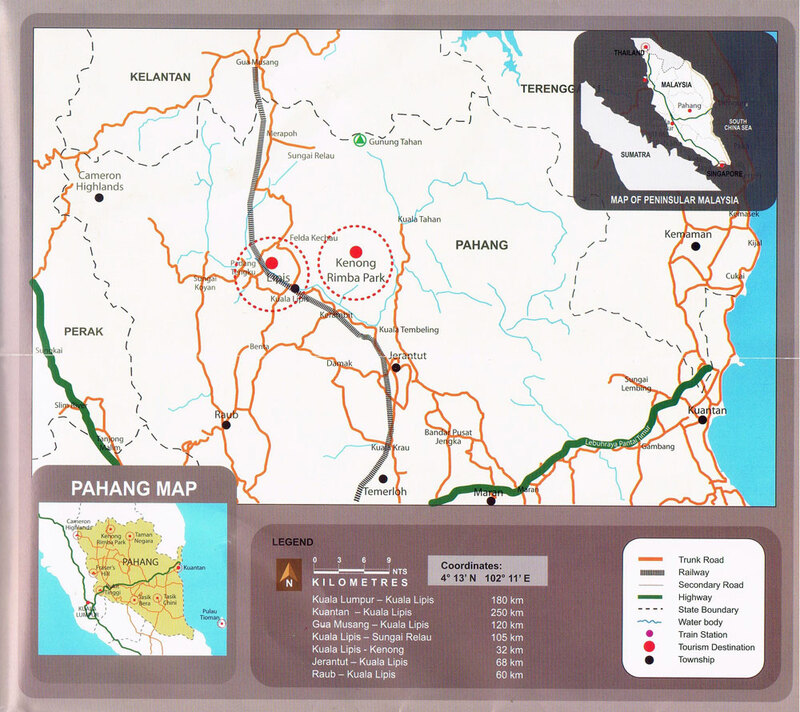 By land it is 15 kilometers through Felda Kechau with four wheel drive. A qualified and registered guide must accompany any visitor entering the park. They are responsible for submitting visitors‘ registration forms to the Kuala Lipis District Forest Office prior to entering the park. 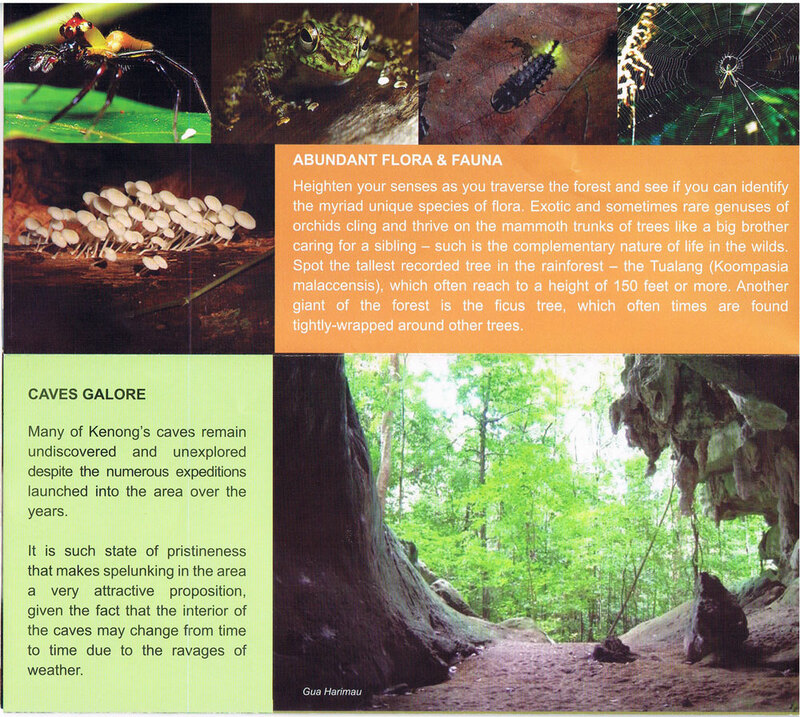 Kenong‘s complicated cave complex is every adventurer‘s dream.The different and inexhaustible formation of caves in the area is all but legendary. The rugged terrain in and around the Kenong area has opened up opportunities for newer pursuits, including a 4-wheel drive challenge, motor cross, cub cross, and All Terrain Vehicle (ATV) endurance tests. Always bring along a reliable guide, who can be hired from Tourist Office situated at Kuala Lipis Railway Station or from caving clubs. 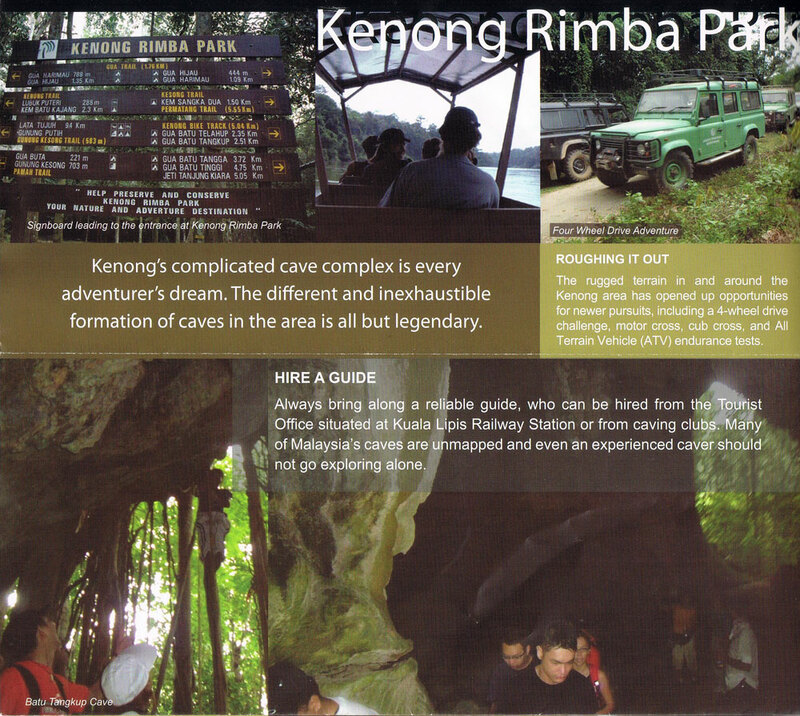 Many of Malaysia‘s caves are unmapped and even an experienced caver shouId not go exploring alone. Depending on the type of caves you pick to visit, some are relatively easy to tackle, while others may require you to master the art of body contortion! The darkness of the caverns needs to be suitably lighted up, so always bring along reliable backup torch Iights and extra batteries. Sightings of wildlife are unpredictable; therefore lt is highly advisable to hire the expertise of a knowledgeable guide to increase your chances of catching a glimpse of the elusive denizens of the forest. lt is important that you map out the area you wish to explore and prepare adequate supplies for your trip. Double check your equipments before venturing into cave or abseiling. Plan how much lighting you will need and bring along the necessary supply of carbide to Iight your way. A kilogram of carbide can sustain you for approximately six to eight hours. The profusion of caves and subterranean rocky formations makes caving (or spelunking) a popular activity around these parts. Barring the fragility of age, all you need is enthusiasm and a spirit of adventure. Climbing the Kesong VaIley range will uncover more interesting caves. 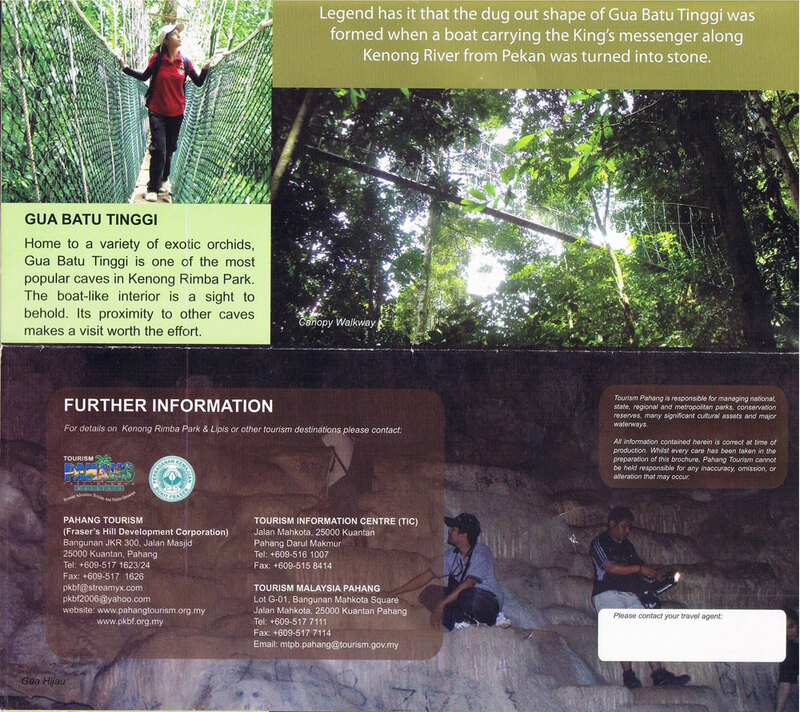 Some notable caves in the park include Batu Tangga cave, Batu Tangkup cave and Batu Telahup cave. You can also drift down the Kenong River by a dugout canoe to enjoy the refreshing riverscape. cascading waters that gushes over seven rocky levels into a pool — making it a great spot for swimming. Cast a line and try your luck at fishing too! The town of Kuala Lipis evolved af the confluence of the Lipis River and Jelai River. Due to its strategic location, the town grew into a prominent trading and commercial centre in the state. So prominent was the town that the British, who came to Pahang since 1827 made Kuala Lipis the state capital in 1891, and remained so until 1955 when Kuantan, the present state capital took over the honors. Now, though no longer a bustling trading centre, it remains as the administrative centre for the District of Lipis, one of the largest in Pahang. A small, yet significant structure that is not to be missed is the ‘0‘ milestone, Iocated near the post office. lt is believed that the measurement of road distances in the district during the time of British rule started from this point. During the days of the British, Kuala Lipis was a thriving town and trading centre. This was due to its strategic location. Today, all that has passed, but the legacy of its heyday lives on in the grand buildings and other relics scattered about town. The District Office, Clifford School, and the Pahang Club are some of the more noticeable remnants from the colonial era. 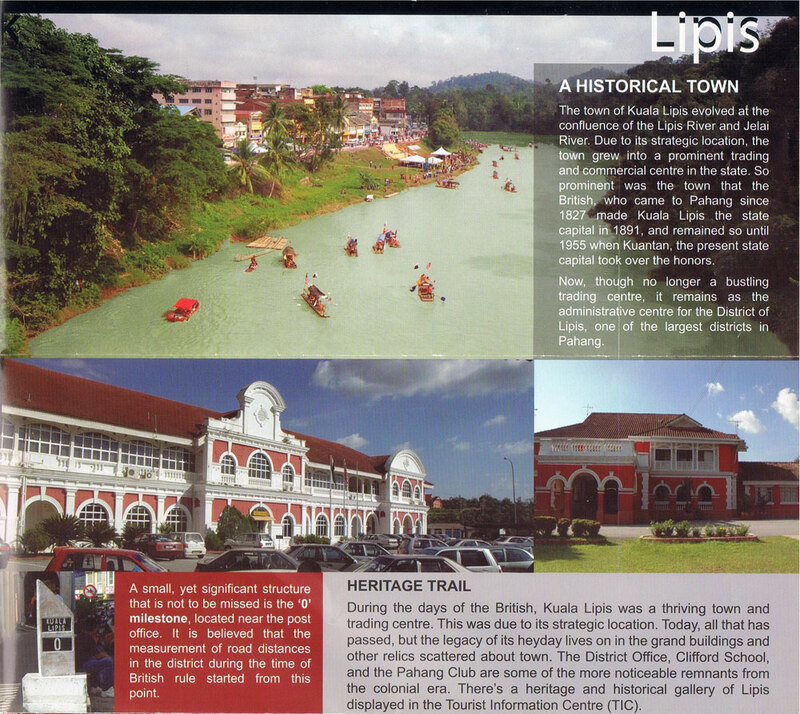 There‘s a heritage and historical gallery of Lipis displayed in the Tourist Information Centre (TIC). 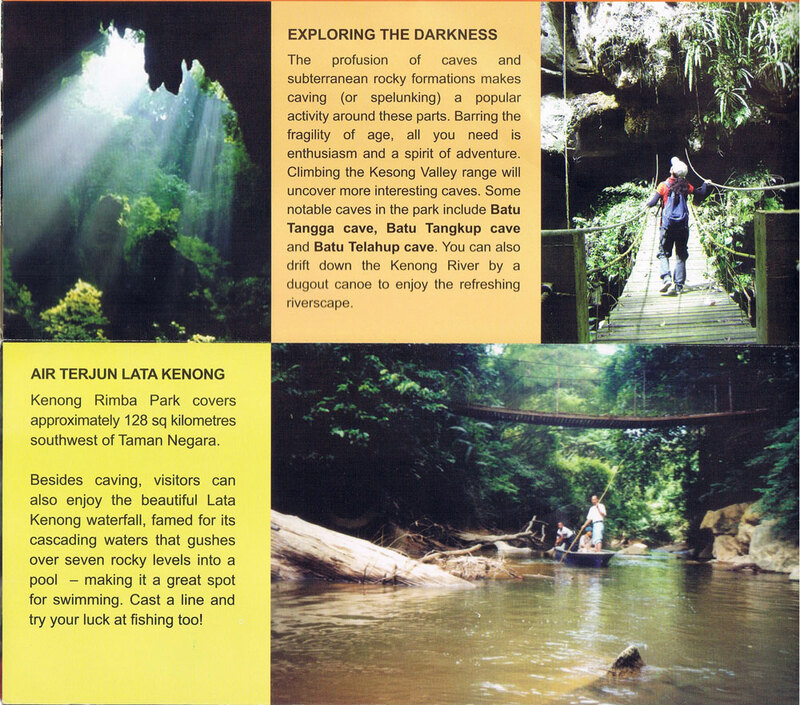 For a challenging cave exploration, just head to Bama Cave at Kampung Relong for an awesome and enriching experience. Visit the mini zoo at Bukit Bius while you‘re in Lipis. 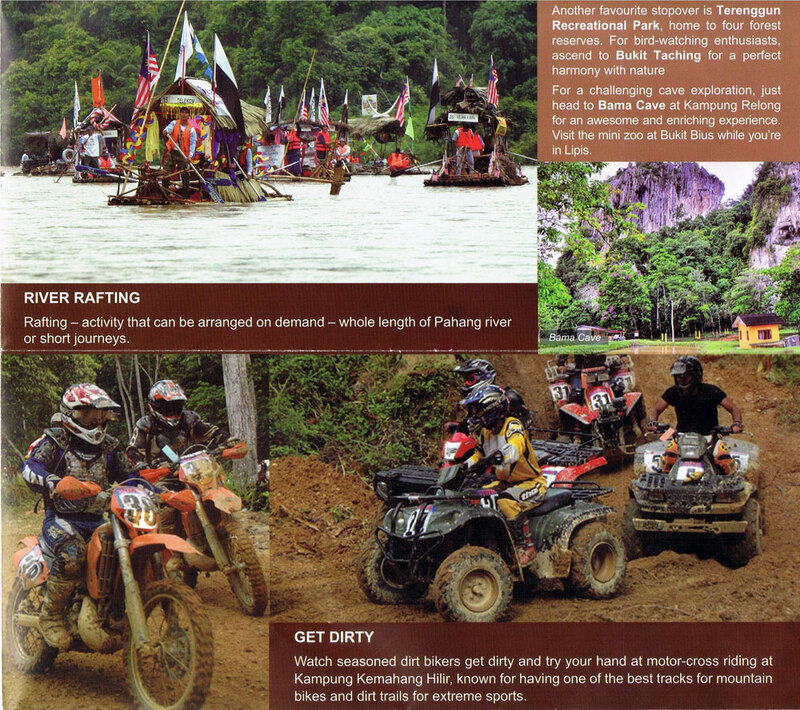 Rafting — activity that can be arranged on demand — whole Iength of Pahang river or short journeys. Watch seasoned dirt bikers get dirty and try your hand at motor-cross riding at Kampung Kemahang Hilir, known for having one of the best tracks for mountain bikes and dirt trails for extreme sports. There are several beautiful jungle trails within the park. Here, nature lovers are able to appreciate the natural beauty of the park, endowed with vast treasures of exotic flora and fauna. From Merapoh, it is another way to reach Gunung Tahan. 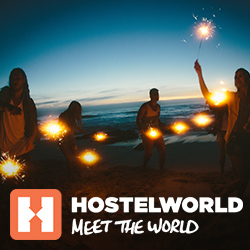 one of Malaysia‘s top homestay experiences. Observe the making of 'GuIa Kabung' wild palm sugar (an all natural sweetener).